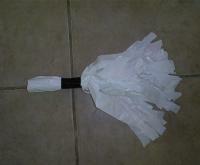 It is easy to learn how to make cheerleading pom pons. There are two ways to attain pom pons: one is to buy them, the other is to make them. 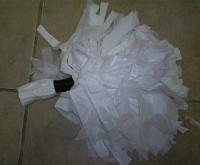 Not only does making pom pons save some money, it is also a lot of fun! Note: Garbage bags can be found in many different colors to match your team. Check places like the dollar store for great deals on colored garbage bags. 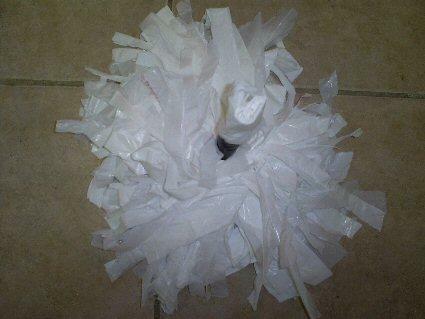 Also, using thicker bags will help your poms turn out better and last longer. Before you begin, you will need to prepare a flat surface. The surface needs to be hard, flat and scissor resistant. Do not do this project on nice hardwood floors; rather, complete this project on a concrete surface or older table. 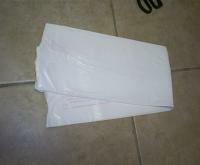 Take the garbage bags out of the box and lay them flat. When taking them out, you will notice they are folded. Keep them as they come out of the box, just unrolled. If you are using different colors in your pom pons, lay them out accordingly. For instance, you can alternate black and white bags to get a mixed color effect. This is your pom pon, so add as many colors as you would like. Note: When laying out your colors, keep in mind they will later be folded; therefore, the colors will mimic on the opposite side. Cut both the top and the bottom ends of the bag. This will leave both sides open and unsealed. 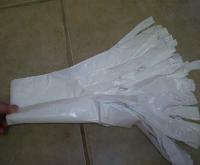 Fold the ten bags in half evenly. There should be no overhang at the bottom. You will now notice the folded area is secure and closed while all open ends are at the top. Cut the strips. 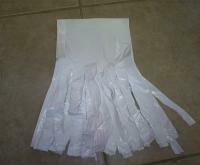 Cutting the pom pon strips is not an exact art. However, some people feel more comfortable measuring. If you are one of these people, you can measure out each strand to be a certain width. 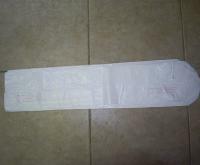 For the most part, you can just cut strips about the size that makes between 10-12 strips across the bag. Pay special attention to only cut the strip down as far as where you want the handle to begin. For instance, about 4-5 inches from the fold. Roll the bags from one side to another. This motion is similar to rolling up paper starting from the side to create a tube. Tape the pom pon handle, which is the 4-5 inches that were left from the cutting. Make sure the tape is on nice and tight so the handles will endure wear and tear. 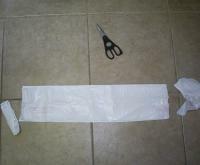 Fold the handle up from the bottom to make a shorter handle, or leave it as it is. Some people even like to put a covering over the area to create a cleaner look. 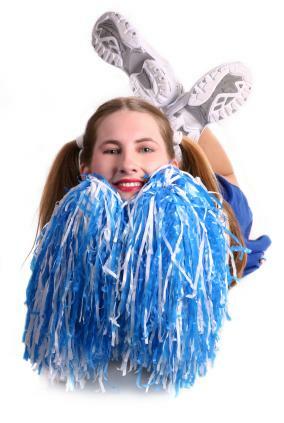 To achieve the look of a cheerleader pom pon, the pom pon must then be fluffed. You can do this by taking the strips in your hand, usually about 5 or so at a time and rubbing them together, between your palms. Using a slight amount of water to make your hands damp before rubbing seems to increase the look desired when fluffing. Fluffing usually takes anywhere from 3-6 minutes, depending on how full you would like your cheerleading pom pon to look. At this point, you can evaluate the length of the strips and see if they need to be trimmed. If you notice the strips need to be trimmed, simply gather the strips in a bunch and hold them tightly together. You can then trim them as much as you like. Note: Trim the pom pon strips little by little to make sure they are not over trimmed. Now that you know how to make cheerleading pom pons, try it and have fun while adding an item to your cheerleading inventory!